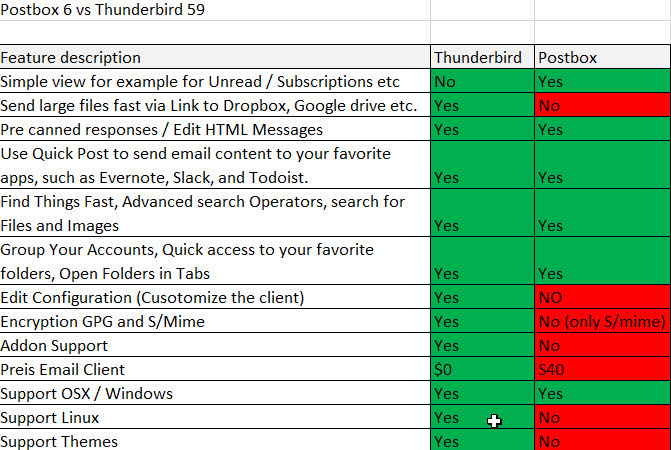 When I bought a postbox license I wanted to have an extended Thunderbird client. That’s why I was willing to spend money on a license. Now that I had the opportunity to test the beta version (version 6) on Postbox I had to find out that the manufacturer has deteriorated his product instead of improving it. So I can only advise everyone against buying a Postbox license. Mine why should I finally spend money on something I can get (apart from the design you don’t normally pay for) as well and more in the free Thunderbird version. I took the trouble to put the most important functions in a table which compares the most important functions of Postbox with those of Thunderbird. So that everyone can get an idea of what they get for their money and what they don’t. But what does Firefox have to do with Thunderbird. One is a browser and the other an email client? Unfortunately, this statement makes no sense to me. And I also don’t think addons will be removed in Thunderbird in the near future. I also read at Mozilla’s once. Starting with Firefox 57, the Mozilla browser only supports extensions in web extension format. So the statement is also wrong that NO addons are supported anymore but only the old ones can no longer be used. So I think it was just a very weak excuse from the manufacturer why they don’t support addons anymore and therefore also the support for e.g. encryption. Dieser Beitrag wurde unter Allgemein, Mail, Meinungen, Software abgelegt und mit compare, License, postbox, Thunderbird verschlagwortet. Setze ein Lesezeichen auf den Permalink.